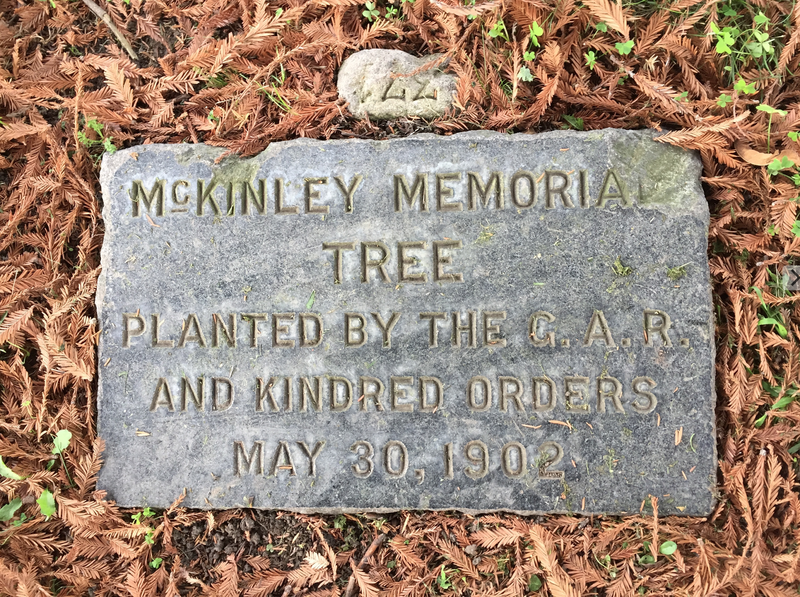 The McKinley Memorial Tree was dedicated on May 30, 1902 under the auspices of Company A, Veteran Reserves of the Grand Army of the Republic. 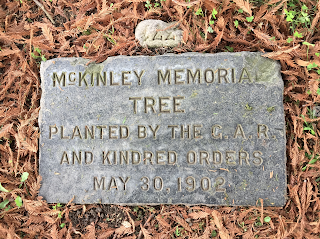 The tree was planted in memory of President William McKinley, who was assassinated on September 14, 1901, six months into his second term. Speakers at the tree planting included Senator G.R. Lukens and former Oakland Mayor George Pardee, who would become California's governor in the November election. The original tree was a Giant Sequoia (Sequoia gigantea), which is no longer present. According to docent and tree expert Chris Pattilo, the current tree is a Coastal Redwood (Sequoia sempervirens). The tree was planted with soil from historic battlefields by local school children, as the Elks Quartette performed. The site has become a common location for annual Memorial Day tributes. The Great Influenza Pandemic of 1918-19 killed about 20 million people, far more than the 17 million who died in the war. According to the Deseret News, an estimated 675,000 Americans died of influenza during the pandemic, ten times as many as in WWI. Of the U.S. soldiers who died in Europe, half of them fell to the influenza virus and not to the enemy. Berkeley resident James Gimbel was one of them. The close quarters and massive troop movements of World War I hastened the pandemic and probably both increased transmission and augmented mutation. The war may also have increased the lethalness of the virus and some speculate the soldiers' immune systems were weakened by undernourishment, as well as the stresses of combat and chemical attacks. After being drafted, Gimble ended up in France via Camp Kerney in San Diego, Arizona, Canada and eventually England. In a letter to his parents, he bemoaned the fact that he was too ill to help a fellow Berkeley soldier who was lying on the ground. He died in France on November 17 of the flu. Carl Castlemann Jones was a semi-professional baseball player who was killed in WWI. 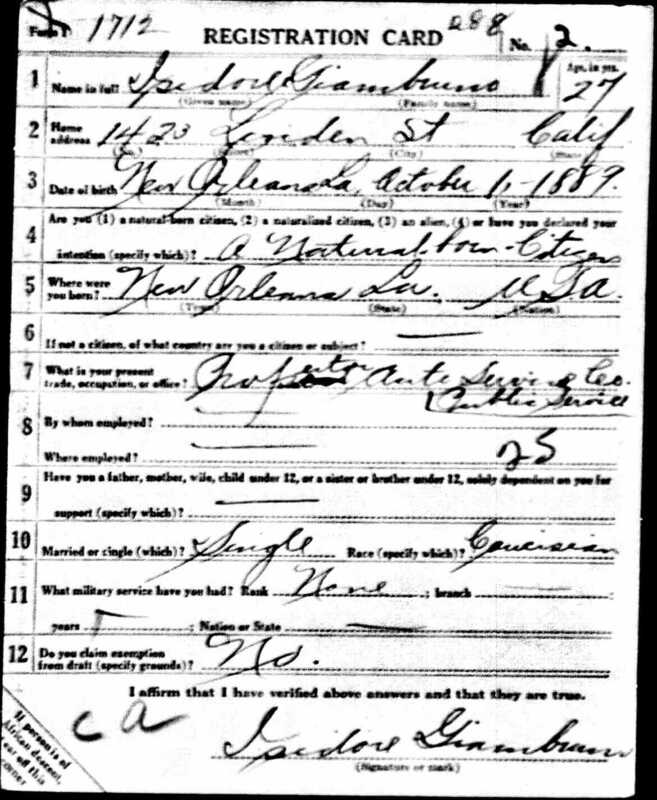 He born in Oakland in 1892 to Ada and Fred Soule Jones. He was raised in Piedmont and became a noted baseball player in the area. In 1914, he played second base for Bill Glavin’s Federals team which participated in a four-team league that played under artificial lights – still quite a novelty at that time. During the winter of 1914/15, he played for the Dreier & Nevis team in the Oakland Merchant’s League. Then, during the summer of 1915, he played in the Carbon-Emery League in Utah, a league made up of coal mining teams. Jones led that circuit with a .387 batting average. In October 1915, he was signed by the Maxwell Hardware Company to play in the highly competitive semi-pro Oakland Tribune Midwinter League. His teammates that year included Carl Zamloch, who pitched for the Detroit Tigers in 1913 and remained in minor league baseball into the 1930s; Tom Fitzsimmons, who would play for Brooklyn in 1919; Ralph Croll, who would go on to play for the Oakland Oaks and Joe Devine, who had made a couple of appearances with the Oaks that summer. In 1916, he received a lucrative offer from the Ambrose Tailors baseball team in Oakland, but that but ended up Jackson in Amador County, California, where he played throughout the summer. He joined Alameda in the Midwinter League in November 1916, then was appointed manager of the newly-formed Exeter Athletics in March 1917. He was drafted into military service in September 1917, and was assigned to Camp Lewis at American Lake, near Tacoma, Washington. He served with Company K of the 363rd Infantry Regiment and in April 1918, where he asked friends back in Oakland for bats, gloves and uniforms to help him organize a baseball team. The Oakland Tribune responded by arranging benefit shows at Pantages Theater with all proceeds being used to buy equipment for troops. 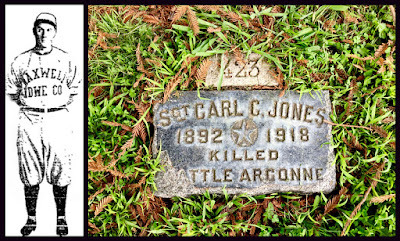 Jones played shortstop for the 363rd Regiment baseball team at American Lake, but the season was short-lived as the regiment, as part of the 91st Division, was on its way overseas and arrived in France in June 1918. 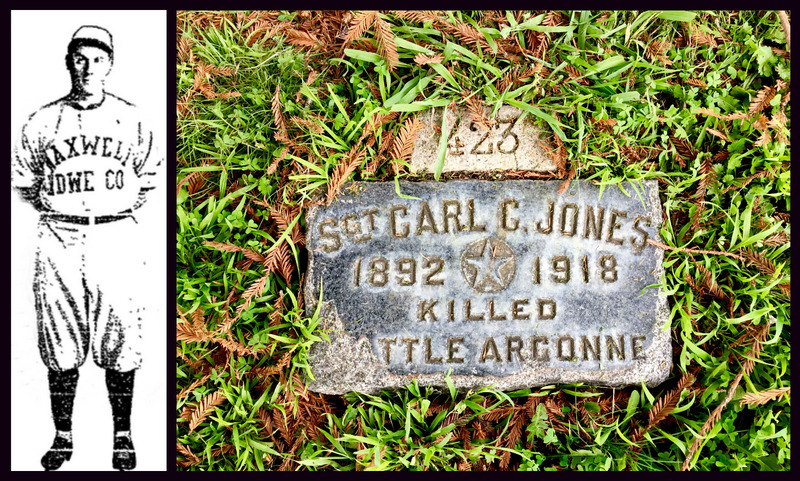 Sergeant Carl Jones was killed in action during the Battle of the Argonne Forest in October 1918. The Battle of the Argonne Forest (also known as the Meuse-Argonne Offensive), was a major part of the final Allied offensive of World War I that stretched along the entire Western Front. The battle was fought from September 26, 1918, until the Armistice of November 11, 1918, a total of 47 days. The battle was the largest in United States military history, involving 1.2 million American soldiers, and was one of a series of Allied attacks known as the Hundred Days Offensive, which brought the war to an end. The battle cost 28,000 German lives and 26,277 American lives, making it the largest and bloodiest operation of World War I for the American Expeditionary Force, which was commanded by General John J. Pershing. American losses were exacerbated by the inexperience of many of the troops and tactics used during the early phases of the operation. 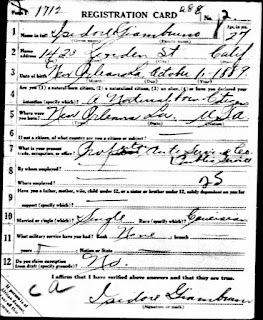 Isidore Giambruno was born in New Orleans and shows up in Oakland records as early as 1905, the year that his father Reverend Giovanni Battista Giambruno died. In the 1910 Oakland Directory he was listed as a meat cutter and in the 1916 Directory as chauffeur. He was drafted into the Army, served as a bugler, and was killed in action in September 27, 1918 at the Battle of Argonne. The American Expeditionary Forces lost 26,277 men and saw another 95,786 wounded at the infamous battle. He was serving with Company D, 363rd Infantry 91st Division under Brigadier General Frederick S. Foltz and Major General William H. Johnston. His unit fought in the Meuse-Argonne Offensive and successfully helped to destroy the German First Guard Division and continued to smash through three successive enemy lines. A month after Giambruno died and twelve days before the end of World War I, his division, as part of the VII Corps of the French Sixth Army, helped drive the Germans east across the Escaut River. The division was awarded separate campaign streamers for its active role in the Lorraine, Meuse-Argonne and Ypres-Lys campaigns. His body was not returned to the United States until October 1921, when he was buried with military honors by members of Oakland Post No. 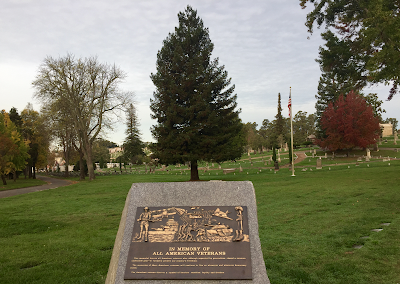 5 of the American Legion at Mountain View Cemetery. 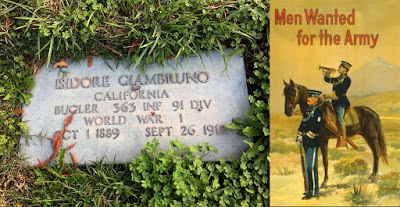 We don't know if Giambruno played taps on his bugle for any of his fellow soldiers, but it is likely. Taps is a bugle call played at dusk, during flag ceremonies, and at military funerals by the United States armed forces. The official military version is played by a single bugle or trumpet. The tune is also sometimes known as Butterfield's Lullaby, or by the first line of the lyric, Day Is Done. The tune is a variation of an earlier bugle call known as the Scott Tattoo, which was used in the U.S. from 1835 until 1860. It was arranged in its present form by the Union Army Brigadier General Daniel Butterfield, an American Civil War general and Medal of Honor recipient. Taps replaced a previous French bugle call used to signal "lights out."